Russian-led forces have mounted 30 attacks on Ukrainian troops in Donbas in the past day, using heavy weapons in five instances, including Grad MLR systems, with no casualties reported, the press centre of the Joint Forces Operation (JFO) has reported. 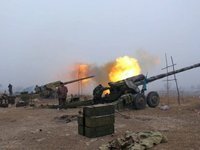 "The enemy opened fire on the positions of our troops 30 times, including five times with weapons, which is prohibited by Minsk agreements. There is no casualty among the personnel of the JFO," the press center of Ukraine's Joint Forces Operation said in its update on Facebook on Friday morning.